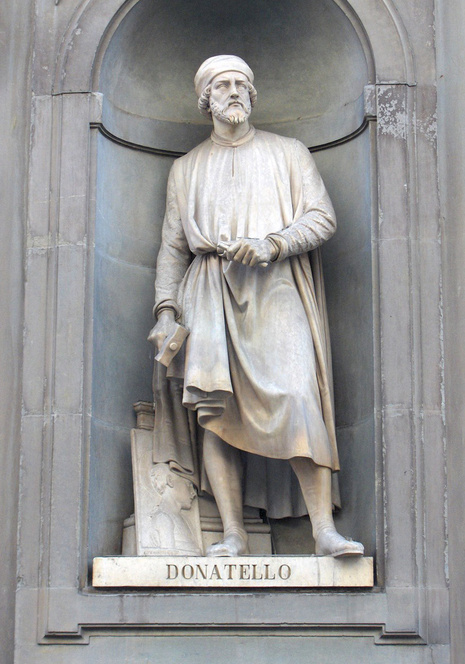 Donatello's Saint Mark (1411-1413), is a marble statue that stands approximately seven feet and nine inches high in an exterior niche of the Orsanmichele church, Florence. Donatello was commissioned by the linen weaver’s guild to complete three pieces for the project. St. Mark was the first of his contributions. The niche itself was not of Donatello's hand, but created most probably by two stone carvers named Perfetto di Giovanni and Albizzo di Pietro. Today, a copy of the statue stands in the original's place, while the real St. Mark is housed inside the church's museum. The full power of Donatello first appeared in two marble statues, St. Mark and St. George (both completed c. 1415), for niches on the exterior of Or San Michele, the church of Florentine guilds (St. George has been replaced by a copy; the original is now in the Museo del Bargello). Here, for the first time since classical antiquity and in striking contrast to medieval art, the human body is rendered as a self-activating, functional organism, and the human personality is shown with a confidence in its own worth. The same qualities came increasingly to the fore in a series of five prophet statues that Donatello did beginning in 1416 for the niches of the campanile, the bell tower of the cathedral (all these figures, together with others by lesser masters, were later removed to the Museo dell’Opera del Duomo).